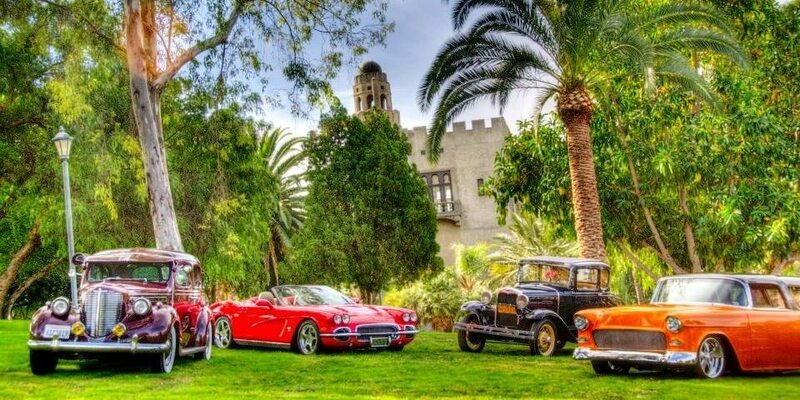 Heacock Classic Insurance is proud to sponsor the inaugural Crossroads Car Show known as “The Benedict Castle Concours” in Riverside on March 29th, 2014. This event is going to break ground in an effort to unite the hobby and present a taste of every major car genre placed all over the breathtaking grounds of a Castle. Heacock Classic and Crossroads invite you to come out and see 300 stunning cars, hear live bands, meet George Barris, the King of Kustoms (showing his original “Munster Koach”), be a part of the filming of Car Crazy TV with host Barry Meguiar, enjoy BBQ Tri-Tip and Burgers in the Heacock Classic Castle Courtyard, visit vendor booths and hear our MC, Dave McClelland (the former Voice of NHRA). If that isn’t enough, for the Ladies, we are hosting a High Tea, Fashion Show and Boutique in the Castle. Public Parking is at the UCR Lot at 3993 Canyon Crest Drive for $5. (Air conditioned shuttles will transport you to the Castle all day) Admission at the Gate is $5 or a Pass may be purchased to the Petersen Automotive VIP Pavilion (which includes VIP Parking) on the Car Registration Page. We still have room for Show Cars. Get your registration in immediately. The best part of all… we are raising money for Teen Challenge. Help us launch what is sure to be one of the best shows in all of Southern California. See you there 10 am! For more information check out the event website at http://www.crossroadscarshow.com.